Just as intelligence is difficult to explain in a precise manner, so is creativity. While intelligence refers to one's capacity to understand, creativity can be referred to as one's capacity to think in unique ways and solve problems in an imaginative manner. However, intelligence and creativity are not necessarily linked. People who are highly intelligent may not be very creative at all while extremely creative individuals may not have a particularly high IQ. Creativity can be demonstrated in endless ways, from creative writing to painting to architecture to simply performing any task in a creative manner, whether it is parenting, teaching, or building and repairing things. Whatever a person's creative talent may be, the key to creativity lies in divergent thinking. Many people will respond to questions using convergent thinking (thinking that is driven by knowledge and logic). Divergent thinkers, however, will respond to queries with unusual but still appropriate answers. For example, if a convergent thinker were asked how many ways he could think of to use a book, he might respond with a conventional answer such as, "You can read it and learn from it." A divergent thinker also gives conventional answers such as those given by a convergent thinker. But he may be more creative and say, "You could pile books on top of each other to create a step stool, or you could use the book as a doorstop, or you could use it as a serving tray." because they also tend to be self-reliant and unafraid to voice their true feelings even if they go against conventional wisdom. 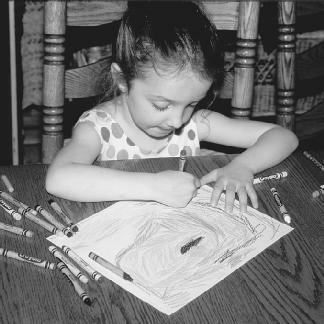 In addition to taking some of the suggestions in the "The Creative Household" sidebar (see page 320), child development specialists suggest that there are other specific ways to promote creativity in children. Parents, guardians, and teachers should urge children to think divergently and come up with many different answers to a question or problem, answers that may fall outside of a traditional response, and should be careful not to ridicule an offbeat solution; rather, this sort of response should be taken seriously. Children should also be encouraged to be free thinkers who do not always accept things as they are but, rather, question what is and why it is. In this vein, too, kids should feel they have a right to examine things independently and not always accept the answer, "Because that's just the way things are." While no one is precisely sure why certain people are creative while others are not particularly so, researchers have been able to identify certain qualities that are often present in the upbringing and home environments of creative people. Parents and guardians of creative children have been found to have some things in common. Specifically, they are not very critical of their children and urge their children to pursue new activities and experiences. They also encourage openness and value creative thinking and curiosity; unusual questions and skills are also valued. Another aspect these households share is that they are not overly strict in terms of having a lot of formal rules. There are a lot of family discussions and kids learn values and good behavior through these discussions and through modeling (see section on Learning). Adults in these households also try to give children access to lessons in different areas (dance, sports, music) and provide equipment to carry out these activities. Creative kids are also likely to collect certain things (dolls, trading cards), which is usually done with a parent's support. A strong sense of play and silliness was also present in the home. Of course, creative individuals are raised in households of all kinds, and not just in environments such as described here. Certainly, none of these things guarantees that a child or adult will necessarily be a creative person but it will help people to think creatively and to "color outside the lines."